My hubby asked for more rice with this. I could almost drink the gravy like soup and drenched my rice with it, of which something I rarely do except with curry. 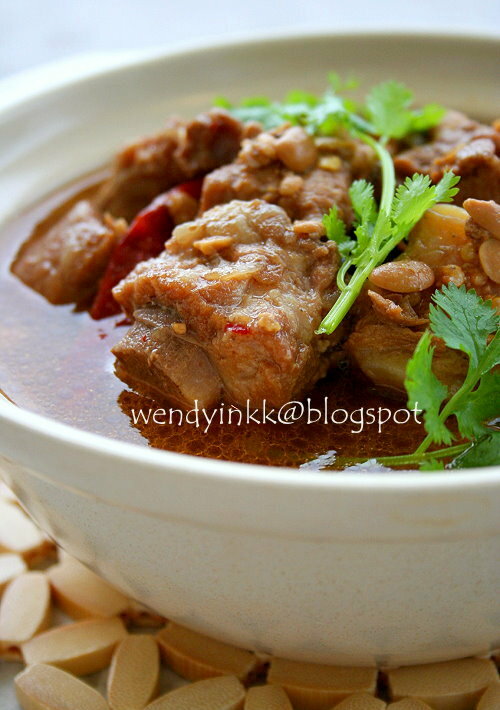 I was "captured" by this recipe because of the use of bayleaf in a Chinese pork stew. Bayleaf ??? Oh yes, and it really does give the good old bean paste ribs a new twist. Doesn't taste like the usual one that every mom cooks. I did some modifications to the method bcause the original source didn't saute the aromatics, something that I will prefer doing. And I didn't parboil the ribs. Since there were no amount of ingredients given in the source, I eyeballed it by looking at the pictures. I've cooked this twice and both times using the same amount of ingredients, came out the same way, not much different. The gravy is meant to be soup like (like how it is in the source), so I hope you will not thicken it. Drench it with your rice.. it's delicious. 4 gm dried chilli (about 4 regular sizes ones, mine were short, so I used more than 4), seeds removed and rinsed. 1. Heat pot with 2 Tbsp oil. Put in sliced shallots and ginger and fry until fragrant. 2. Put in dried chilli and bean paste and fry for a while. 3. Put in pork ribs and cook until the surface looks opaque. 4. Pour in enough water to cover and put in bay leaf, star anise, shaoxing wine and sugar. 5. Bring to a boil. Simmer on low heat for 1 hour or use a pressure cooker for 5 minutes. 6. Do final seasoning with salt and sprinkle on coriander and it’s ready to serve. *to get a clearer ‘soup like’ stew, parboil the ribs and drain before use. It's mid semester break for my girls and I'll be enjoying the break with them. Longer sleep in the morning, LOL. I love this.....can eat 2 bowls of rice...lol! I bet this must be really delicious when you said you can drink the gravy like soup. Of course, I am going to cook this soon too. Your dishes always makes me wanted to cook the same like yours! Thank you lots and lots Wendy! how salty this is, depends on how much salt u put in. The bean paste alone won't be very salty. Like I said, the amount of salt is up to you, use it or none at all, it depends on the gravy amount and the bean paste itself. 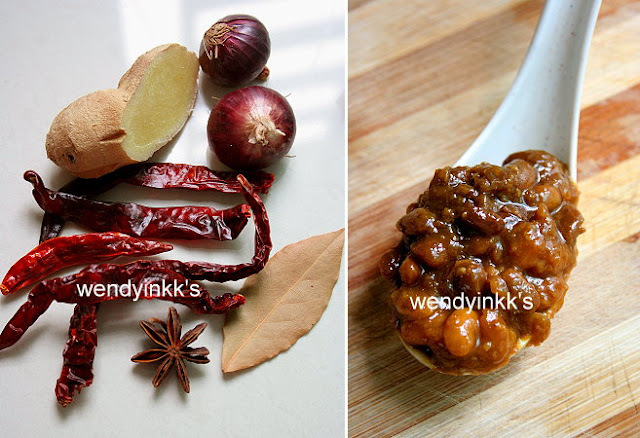 It certainly looks yummy and it amazes me that you use western herbs like bayleaf to mix in chinese dishes. gonna try it 1 day. That's what attracted me to try this recipe. I cook to feed my family, it's a chore. i've tried bay leaf once to cook pork trotter and the rest of the ingredients were garlic, szechuan pepper, also cannot remember what else , that was so many years ago but no bean paste and the dish tasted a little odd. Just couldnt tell what caused that taste..maybe it's a combination of all..but now after hearing what you said here, i might like to try bay leaf again. Im sooo gonna make this since hubster loves his gravy.... happy holidays to you. Hmmm.. sometimes flavour combos are funny. Hard to say. I'm sure the problem is with the recipe, not with ur skill, U can cook really well. Haha.. let him flood his rice with this. Same to u! but makes no difference yet right? wow...this is nice with noodles !!! yea, something different with the bayleaf. I am sure it taste good. Have bookmarked it ! can use the dried bay leaf? FRom the pictures, you can see my bay leaf is brown. Fresh ones are green. hahha, so blur of me..
this looks nonya to me! is it slightly nonya-influenced? I love it! 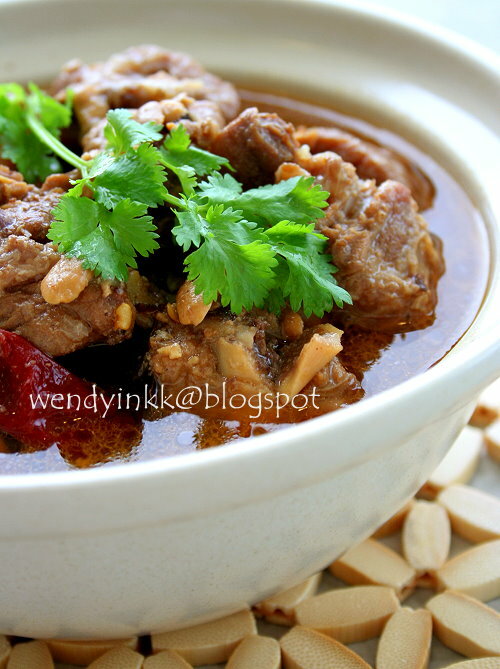 I made somethign similar before using pork belly, but it was from an old peranakan cookbook! I see a star anise in your photo but not in the recipe... Do you include the star anise ? A lot of Sichuan dishes involves chilli and also bean paste. BTW, the ingredients besides the bay leaf is very common in every Chinese household, and beanpaste pork belly is really very very common. Thank you very much for pointing out my mistake. Hi Wendy Thanks alot for another lovely recipe. Before I cook this, is this dish spicy? You are right. Bay leaf being used. Really something new. wah! 1 hour over slow simmer compared to 5 mins with a pressure cooker! Really such a big difference huh!? Yeah, try cooking beans, swapping 15 mins for 3 hours of simmering. My mom used the same recipe using pork leg and adding assam water minus the bay leaf. that is assam pork trotters. 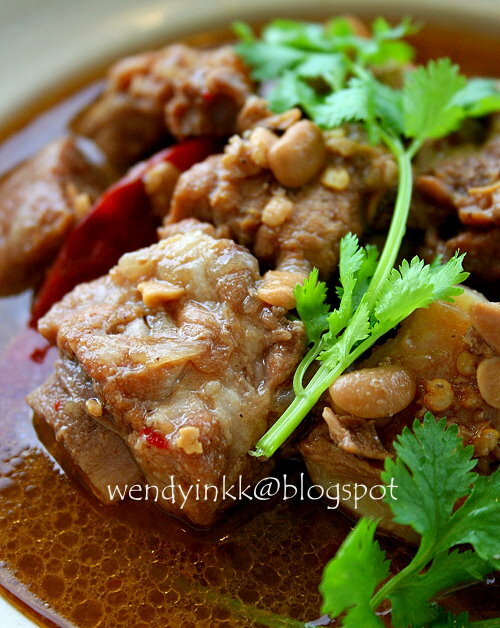 there are many ways to cook different parts of the pork and each is individual. Someday I am gonna try this. Looks damn Shiok! Will it be too spicy for kids with the amount of dry chilli added? For kids, it might be spicy. But depends on the kid themselves too, some kids like it spicy. I like this flavour. It tastes herbal. I finished the gravy with rice. My family enjoys this dish. Anymore food recipes like this? herbal? ok.... but I don't find it herbal, more like aromatic. Go through the index to find something to your liking. I have been to 2 Asian Grocery stores and asked for whole bean paste and neither of them has heard of it. Can you please give me more information on what and where it is I can get the bean paste. I have never lived overseas, hence will not be be familiar with where you can buy ingredients. You can see the type of paste in the picture. Here, there are 2 types of bean paste, one is mashed up, the other type is where the beans are whole, just like in the picture, but the label doesn't state so, you have to see it yourself. Maybe ask for "DouBanJiang", then you look at it, see whether it's mashed up beans or whole beans. 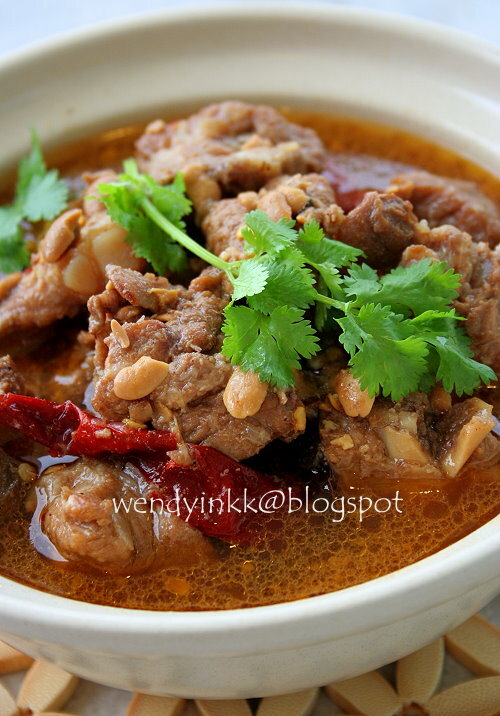 Thanks WendyinKK, I work at Penang...alone miss this food with the family....Today try your this recipe...WoW...i take two bowls rice ... God Bless you. Am writing to you as am cooking this dish of yours. Pork ribs boiling and my nose is appreciating the smell! So thanks Wendy for your wonderful recipes!!! I am so glad you're enjoying ur pregnancy with food. My appetite is quite pathetic whenever i get pregs. Thanks for your recipe - it is yummy ! my family members like it very much. If I don't have bay leaf at the area that I live, what can I substitute it with?